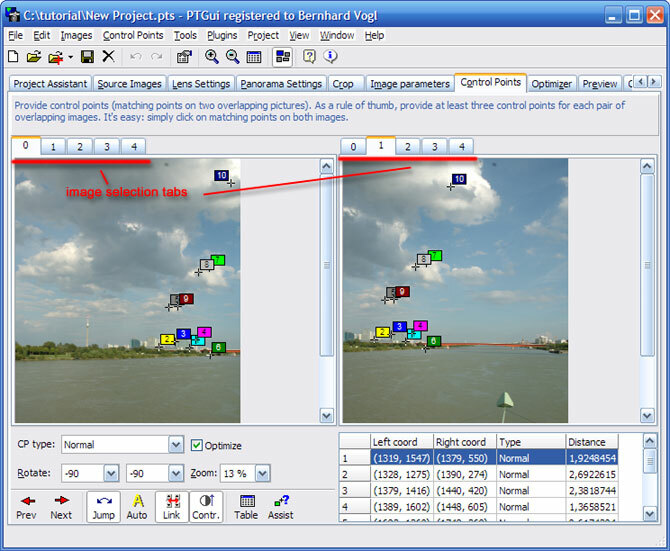 Control points are needed to tell the software the location of the same image feature in two different images. 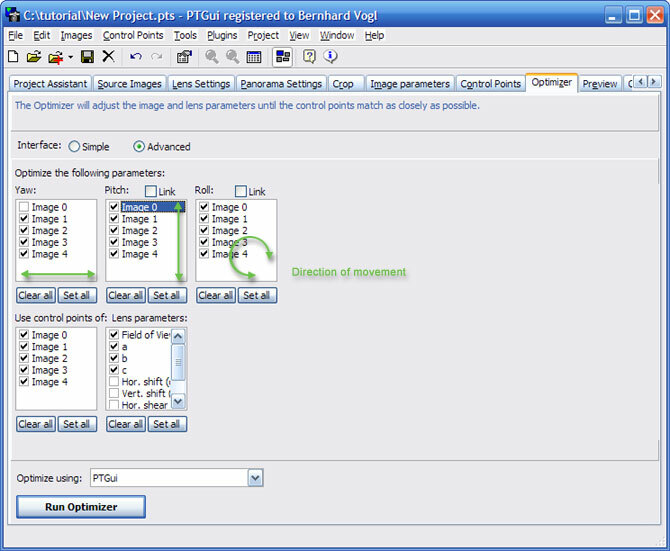 The more control points you set, the more accurate PTGui will be able to align the images. Nevertheless - as mentioned before, you should choose a reasonable number of control points per image pair. Not too few to be able to calculate all parameters correctly but also not too many as you should still be able to check and revise the control points. The minimum number of control points can be determined by counting the parameters you want to optimize. A rule of thumb says that you should use one control point pair for each parameter. e.g. 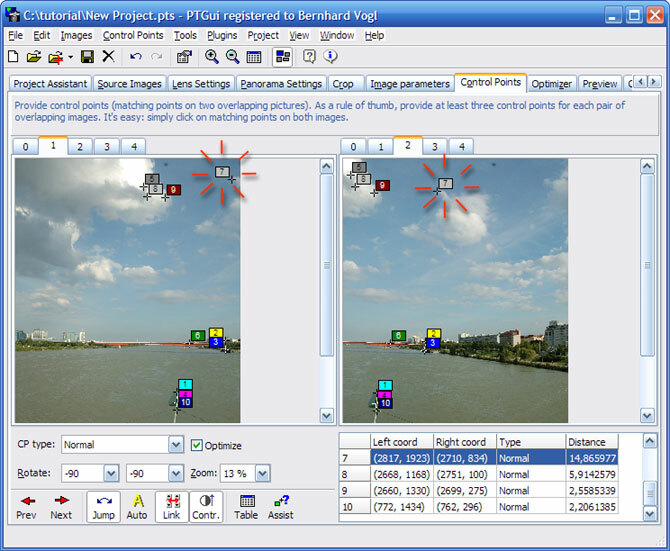 if you already have correct lens parameters and only want to optimize the Yaw, pitch and roll of the images, you have to set 3 control points per image pair. The relative position of CPs to each other can be compared to a "lever force": the further away they are from the rest of the CPs, the more impact they will have on the optimization. So - best practice is, to distribute CPs evenly over your overlapping image areas. 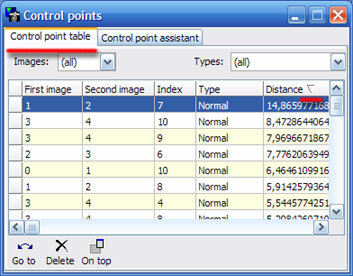 Here you can check, set, delete and move your control points in an intuitive manner. First of all, make sure that you have selected 2 different but overlapping images in the left and right area. You can see tabs in the upper area of the window that represent your source images by numbers. 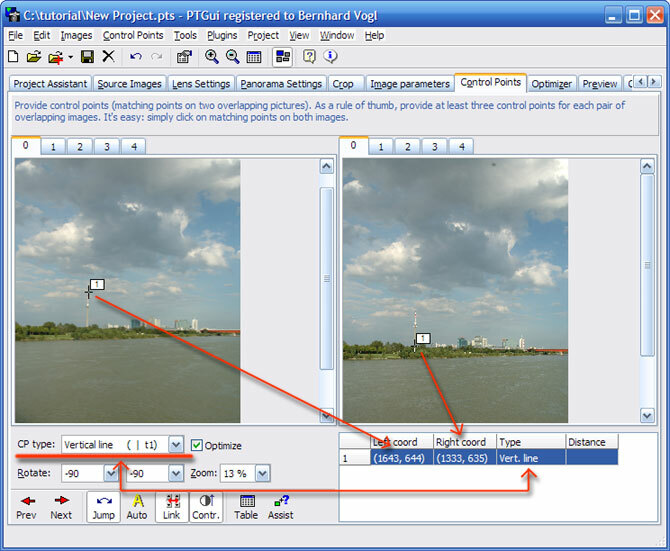 To create a valid pair of control points: Left click with your mouse in one window to set the first control point of an image pair. Left click on the exact same image feature in the other window. You can fine-tune the points by clicking on the "flag" of the control point and move the CP. As soon as you release the mouse button, the new position is fixed. 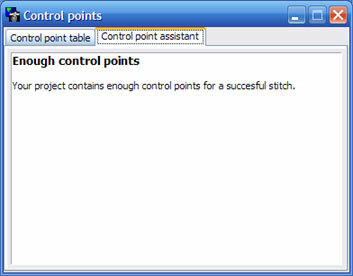 To delete a pair of control points: Right click on the flag of the control point and select "Delete". You should do this for as many source images in your panorama as possible. What will also falsify our optimizations, are incorrectly set control points. 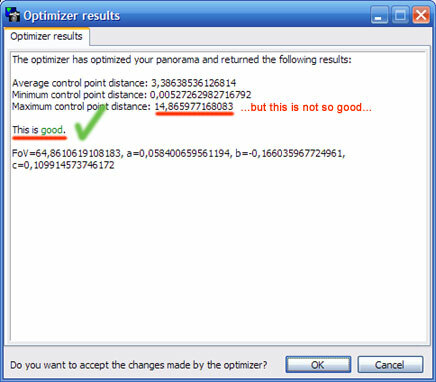 We will now optimize the panorama to calculate control point distances. These distances will give us a clue which control points may be set (or automatically determined) incorrectly. Repeating architectural features are a classical cause of incorrectly set control points, e.g. a repeating ornament. Typically, such features will occur at relatively large distances to each other, resulting in a big "lever force" (see above) in the optimizer. They are the most likely reason for a completely screwed up image alignment in your panorama. Change to the "Optimizer tab". First of all we have to configure the optimization to our needs. If you don't use vertical/horizontal control points you may want to leave the settings as they are (simple) and just optimize. 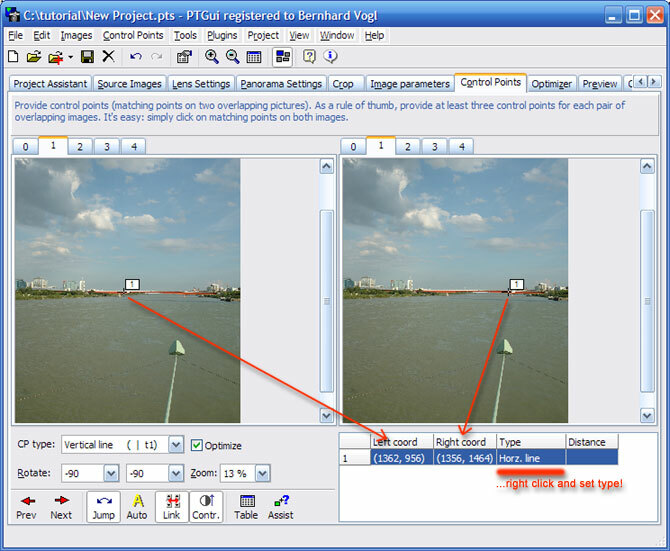 Using vertical/horizontal CPs we have to give the optimizer a chance to move all images freely for finding the correct horizon. In this example, the moving clouds are the problem. There is no other solution than to forego this control point. You may set another CP in exchange for the deleted one (on a non-moving image feature).